According to NOAA scientists, the average temperature for the contiguous U.S. during July was 77.6°F, 3.3°F above the 20th century average, marking the hottest July and the hottest month on record for the nation. This was by a relatively narrow margin. This completes the run of hottest calendar months in the mainland being of recent vintage. July’s record had been held by a dust bowl year, 1936, until last month narrowly beat it out. 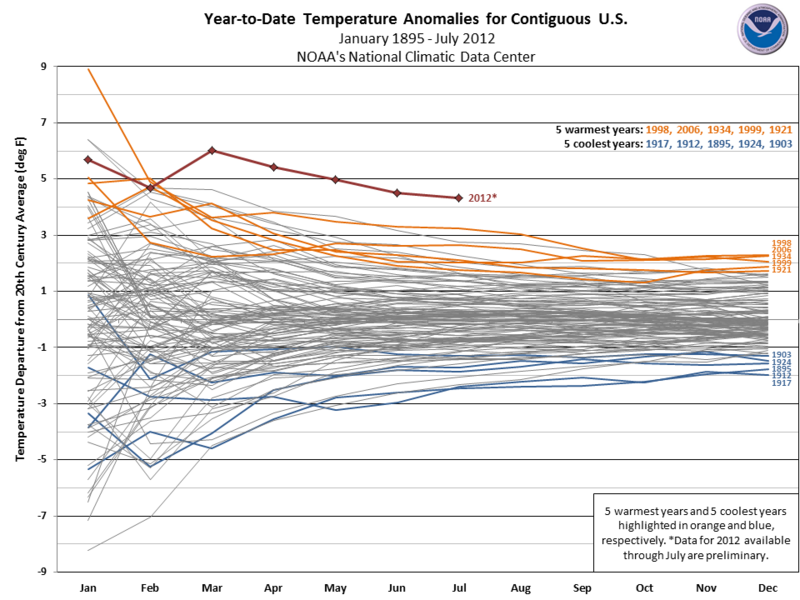 Although the month led 1936 only narrowly, the year is so far an extreme outlier insofar as average temperature is concerned, so much so that it is unlikely that 2012 will not be the warmest year on record to date. This article was posted in Beyond Planet Three.